Over the past few weeks I’ve had a real craving for pancakes and often make them on a Sunday morning for breakfast. I usually make traditional white sugar and flour type pancakes, but this morning I decided to try and make a healthy version. There are heaps of healthy pancake recipes out there but I decided to go it alone and fudge a recipe. These turned out absolutely amazing and it’s hard to believe that they are actually good for you! I also included chia seeds in the mix…it was my first time using chia and it was a success! Anyway, I’m sure anyone would eat these and find them delicious. They aren’t at all heavy and dense, which I thought might be the case with the wholemeal flour and oats…but are light and airy and yum! Give them a go…for something with no processed flour, sugar or oil they are honestly too delicious to believe they are healthy!! 1. Put flour, oats and bicarb soda in a bowl and stir to combine. 2. Add eggs, 2 tbsp maple syrup, milk and chia seeds and whisk until all ingredients are combined. Let rest for 10 minutes. 4. Peel and slice bananas into 1cm slices. Add 1/2 tsp coconut oil to pan and add bananas. Fry until browned and then turn. Add 2 tbsp maple syrup to pan to glaze bananas. 5. 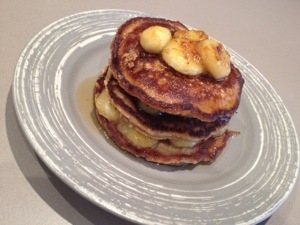 To serve – stack pancakes and bananas and serve with extra maple syrup and Greek yoghurt. * Add 1 tsp of chia seeds to 1/2 cup of water. Let sit for 10 minutes and then stir with fork. Let sit for further 10 minutes before using. You could also serve these with caramelised apples, berries, stewed fruit etc. You can also add blueberries, coconut, sultanas, craisins or choc chips to the batter before cooking. Hi and welcome to my blog. Thanks for dropping by, I really appreciate it. I 'm a lover of all things craft, cooking, DIY and natural. I've been creating all sorts of delicious healthy food, beauty products and craft items lately and need somewhere to share my recipes, successes and occasional disasters! I hope you enjoy...and feedback is always appreciated! The best choc chip cookie recipe I’ve found so far!